WSG is compiling a directory of additional opportunities to assist undergraduate, graduate and postdoctoral scholars in gaining first-hand experience in marine science and policy. The initial list of opportunities on this page will be enhanced as the directory project progresses. Provides undergraduates majoring in the sciences, mathematics, engineering or education with two years of academic assistance and housing and travel costs for 10-week summer internships at NOAA or partner facilities. Supports ongoing or new undergraduate research projects in areas funded by the National Science Foundation at REU sites throughout the country. Places and supports undergraduates studying marine sciences or resource management in a 10-week program with faculty mentors at the Virginia Institute of Marine Sciences. Ten-week summer fellowships from the American Association for the Advancement of Science for undergraduate, graduate, and post-graduate science, engineering, and mathematics students to work as science journalists at media organizations nationwide. Provides financial assistance to upper-level undergraduate women at a college or university in Washington state. Awards a one-year $5,000 scholarship to support graduate-level field-based research in coastal wetlands. Provides undergraduate students and recent graduates with 12-week opportunities to conduct research with scientists or other mentors in the Great Lakes region. 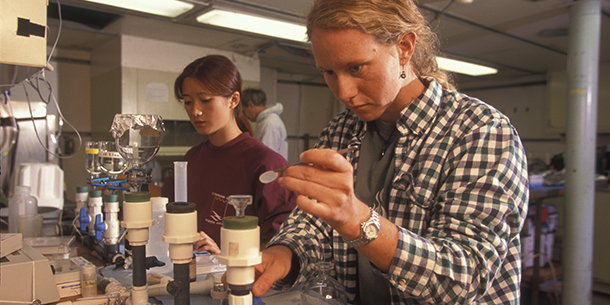 Offers undergraduate students the opportunity to work on ocean and human health and other marine-related research issues in a 10-week summer program. Provides tuition support for undergraduate and graduate students studying marine-related fields or working with remotely operated vehicles (ROVs) or both. Evergreen College has several opportunities for graduate students in the MES program. Some MES internships and fellowships provide support, others do not. MES students are strongly encouraged to complete an internship after their first year in core classes in conjunction with their thesis. Ten-week internship for educators and undergraduate and graduate students that focuses on developing research techniques and improving communication and collaborative skills. Provides undergraduate and graduate students interested in oceanography and ocean exploration the opportunity to work aboard the E/V Nautilus for 2-5 weeks. Provides students with financial support, mentoring and professional development to prepare them academically and professionally for a career in the U.S. Department of State Foreign Service. One-year fellowships from the American Association for the Advancement of Science in Washington, D.C., for postdoctoral researchers and professionals to help scientists and engineers learn about the policymaking process through participation. Sponsors up to 12 predoctoral and postdoctoral fellowships in ecosystem management and water-supply research in California’s San Francisco Bay Sacramento–San Joaquin Delta system. Provides stipends for graduate and postdoctoral students in the sciences, engineering, public policy, and law to pursue studies and projects throughout the National Academies. Offers support for graduate-level independent research in oceanography, marine biology, and maritime archaeology; women and minorities are encouraged to apply. Pairs graduate students in public policy, public health, natural resources, aquatic sciences or other related fields with members of the Great Lakes Commission in Ann Arbor, Michigan, to work on issues that advance the environmental quality and sustainable economic development goals of the Great Lakes states. Two-year postdoctoral fellowships in biological, chemical and physical oceanography, marine geology, and ocean engineering. Provides two years of postdoctoral support to outstanding early-career scientists.